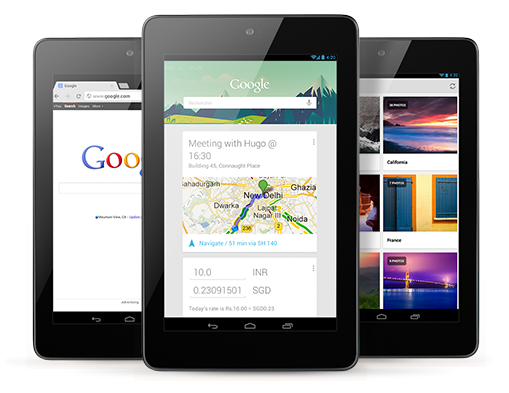 Google Nexus 7 will be released in India by Google, this news came few months back by HomeShop 18 and Snapdeal but then regret message was display for the same. But now this product can be bought from the Google Play Store, you might not be able to see this device page on the Google Play store if you are visiting it from your tablet or mobile phone, so try the same from your desktop. The price of the gadget is 15,999 INR and the shipping charges are not included in the package, once you will be on your way to check out of the cart the shipping charges will be calculated on the basis of the location it is to be delivered. This is the only tablet in the world having quad core processor at such low price, Google team behind this has mentioned that it will lag free as it seems to have the project butter (which is really a big deal when talking about the Android Gadgets). As of now only 16GB model with Wi-Fi is available for the sale, though it has been launched under the variants of 8 GB and 16 GB with and without 3G support but as of now in the India only the above mentioned model is available and this is the first time that Google has tried to sell of its device through Google Play Store, so we can expect to see more models in coming days. All the users who want to store all the movies and series on this tablet will have to hear a bad news as their apart from that 16GB internal storage there is not provision to add more space to it or I should say that there is not external memory card slot. Rest the tablets is great and at very economical price, I will recommend the users to buy this tablet as it is as good as other Android tablets which are available at higher prices. Now, you will not have to look for the over-priced Nexus 7 tablet on e-bay order it now from here and then delivery will start from 5th April onwards. At the price at which this tablet is coming, it is a nice hardware you are getting at this price and we have tested nexus 7 and we suggest this tablet for all those who are looking for a nice 7 inch tablet.